Having had my beach-fix for a few days we headed inland to a site Alan had spotted in Search for Sites. 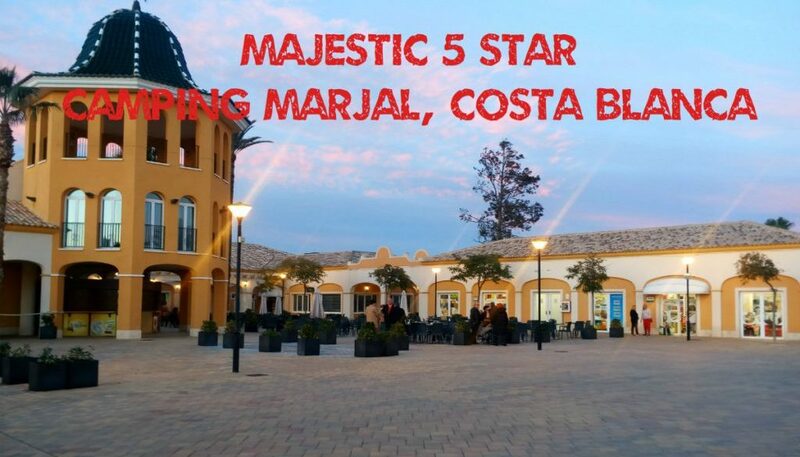 Marjal Camping Costa Blanca is absolutely massive – over 1000 pitches available. Its a 5 star complex with swimming pools, kiddies play area, bars, restaurant, supermarket, gym, electric bike and buggy hire, nightly entertainment – everything you could possibly want on holiday (38.177588, -0.8113547). Its almost like checking into a five star hotel. They even give you a silicon wristband to wear to identify you! We were given a lovely pink coloured band which Alan insisted in putting in his pocket! They have a large airy reception area with three or four English speaking receptionists. We asked if they could take our large van – it is an ACSI site but they said we wouldn’t fit onto their standard pitch and would have to be allocated a larger pitch at €35 a night including electricity. We ended up on a huge 131 square metre pitch which even in our large van we looked lost in. We thought our van was big but some of the vans on this site were huge. Lots of 5th wheels which seemed to be permanently parked with plumbed in air conditioning and their sheds, tents and gazebos put up round their pitch filling every square inch. Lots of Spanish families arrive for the weekend to what seemed like their holiday homes. The toilet blocks were spotlessly clean and very modern. Great hot showers but still with the push button that turns the water off after 30 seconds. On the second morning I was wakened very early to the sound of a kango hammer right outside the van. On investigation it appeared that a maintenance team complete with digger, kango hammer, petrol strimmer, petrol chain saw AND ear defenders had made camp right outside our door on our pitch. As they tried to start their chain saw I approached and asked them what they were doing – with some arm waving and pointing they indicated that they were proposing to dig up the area at the front of our van. “Not today you’re not” I thought and headed off toward the toilet block. Something in my demeanour must have given them the idea they weren’t welcome and when I came back they had gone. As we walked round the site Alan noticed that there were a lot of smaller pitches free in which we could easily have parked our van on so he got out a tape measure and measured them all at 10m long (we are 8.9m) He then went to reception to ask why we’d been out on the most expensive pitch at €35 per night when there were so many standard pitches at €17 a night with ACSI available. We complained bitterly about the workmen with the result that we were able to stay on the large pitch for the ACSI price of €17. We only stayed three days, time to get some washing done and a shower or two. Its a fabulous site with plenty of activities (all of which are paid for separately) and in summer I can imagine its very busy. It is possible to cycle down to the the town of Catral but there’s really no need to leave the site if you don’t want to. We’d stay again but only if we got the ACSI rate. It’s maybe worth mentioning that this is the second site we’ve gone to from the ACSI book that has said that our motorhome is too large for their ACSI pitches, so we have been asked to pay extra for a larger pitch. I can’t find any reference to this being a condition of use in the ACSI book. It means you’re put on the spot at a site – you either pay the extra or go somewhere else. Sometimes going elsewhere isn’t an option. We had decided to move on to a camperstop near Mazarrón. Taray Camperpark is located beside the beach at Puntas De Calnegre. You have to drive through narrow access roads for the plasticos and across a dry river ford to access it, so the drive there was quite stressful. Alan’s cousin had been here a month earlier and had left a good review of the site on www.searchforsites.co.uk. Unfortunately our experience differed greatly, and gave us our first nasty experience of the trip. We have added our own review accordingly. We arrived to find the site full with large Dutch and German vans. We needed some water and seeing that it was a paid for service – we deposited €2 for 200 litres of water and emptied the grey tank.While we were filling with fresh water, two of the “residents” came over to the service area to dump their cassettes. They lifted our hosepipe to duck under it and emptied and rinsed their cassettes right beside where we were filling with fresh water. We found this rather rude as we would have been off the services area within 5 minutes, so we decided that we would not stay and park up on a nearby beach instead where we had seen some other motorhomes parked. On leaving, the manager chased after us. Even though we had paid for our fresh water, he demanded a further €5 for emptying the grey water. I pointed out that he only charged €6 to stay the night and offered him a reasonable €2 to empty the grey as we had already paid for fresh water. He became abusive and said he made the rules and was telephoning the police. I think he was surprised when Alan switched off the engine and told him we would wait for them! He had said the rules were on the notice at the entrance and when I went to photograph it, he pushed me and snatched the phone out of my hand. I called for Alan who got out of the van and told him to hand the phone back immediately. The argument continued with another “nosey” resident coming over to join in. After Alan sent him on his way, he handed the manager €5 – but the turning point was when Alan asked him for a “Factura” as proof of payment. I think this took him by surprise, but having lived in Spain and run a business here we knew the fiscal requirements! He started laughing at Alan and called him a “crazy man” . So Alan took the €5 back off him and we left. The reception committee at Taray! The other campers had huddled together jeering and hissing at us the whole time. Obviously British (or in our case Irish) campers are not welcome here at this time. I would point out that everyone’s experience may differ, but the manager did not endear himself to us as a caring motorhome enthusiast, but rather saw us as a cash cow. Not this time.